Paul the Beatle brings down the house for vintage performance at Armstrong . Beatles Radio: The Beatles, Solos, Covers, Birthdays, News The Fab 4 and More! Paul the Beatle lit up the stage at Armstrong Auditorium, performing songs spanning across the great history of the Beatles. Paul opened up with “All My Lovin” from the Beatles’ second album With the Beatles. 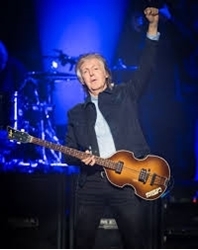 Following performances of “I Saw Her Standing There”, “Yesterday” and “We Can Work it Out”, a medley of some of the Beatles’ most famous songs, including “A Hard Day’s Night”, “Help”, “In My Life”, “Come Together” and “Imagine”, was sung. For this medley, a costume change was performed, and John Lennon came out to declare his creative dominance over the rest of the group. Paul returned, then jumped to 1966, performing “Here, There & Everywhere”, “Got to Get You into My Life”, from the album Revolver. A move to 1967 and Sgt. Pepper’s Lonely Hearts Club Band produced performances of “Sgt. Pepper’s Lonely Hearts Club Band”, “With a Little Help From My Friends”, “She’s Leaving Home” and “When I’m Sixty-Four”.